Galería Javier López is pleased to announce the solo show by British artist, Hannah Collins (London, 1956) this coming Friday 31st of May. This exhibition coincides with the prestigious Spanish festival PHOTOESPAÑA held currently in the capital. For her exhibition at Galería Javier López, Hannah Collins’s presents new color photographic images that resume her series True Stories. The series, shown for the first time at Leo Castelli Gallery in New York in 1998, is composed of images that offer an exceptional glimpse of the rooftop world that characterizes different cities. 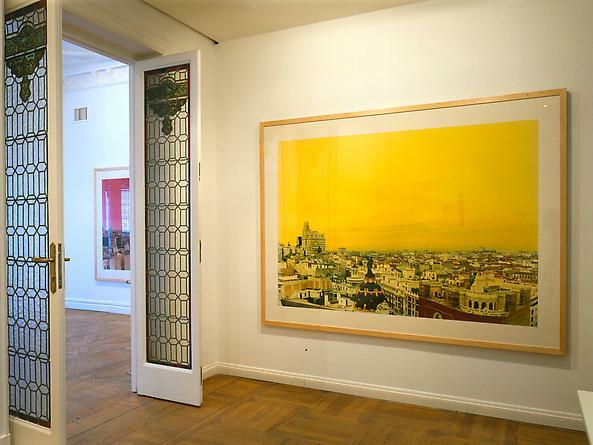 On this occasion, Collins’s presents pieces that capture the views of Madrid. These landscapes show one the other side of the city: a reversed urban fabric under a heavenly, luminous and colored space. On view at the gallery are also her latest black and white photographs. Born and raised in London Hannah Collins’s has been living in Barcelona for years. Her work is part of the current discourse around the photographic image as it has developed within contemporary art. And within this context, Conceptual and Minimal discourse has in particular shaped her work. The artist came across these two artistic currents in the seventies, whilst studying with the Fullbright scholarship in the United States. Collins’s has acknowledged the influence, not of photography, but of sculptures, installations and environmental works by Robert Morris, Richard Serra or Robert Smithson. These influences would determine the development of her conception of photography. She has been concerned with spatial and temporal elements expressed in vernacular architecture, an interest that suggests a common affinity with Gordon Matta-Clark’s work, Becher’s photographs, and Thomas Struth’s empty street panoramas - the so-called “Unconscious Places.” - The photographer’s art defines territories of absence, constituted as a method to rebuild an intimate vision of reality and to restore human scale; a message that her work conveys either through urban landscapes in color or by surprising details in her black and white images. Hannah Collin’s work is well represented in numerous private and public collections, amongst them are: La Maison Européenne de la Photographie in Paris, Tate Gallery in London, MACBA in Barcelona and Museo Nacional Centro de Arte Reina Sofía in Madrid. She has participated in principal collective photographic exhibitions during the eighties and nineties: from “Another Objectivity” in 1988 at the ICA in London, or “L’Invention d’un art” at Centre Georges Pompidou in París, 1989, to “Le Monde après la Photographie” or “Prospect 96” in 1996. It is worth noting her recent participation in the opening exhibition at the Tate Modern in 2000. Highlights of her solo exhibitions, include those organized by: Centre Nationale de la Photographie in Paris, Walker Art Center in Minneapolis, and in Spain at: la Sala Parpalló in Valencia, Koldo Mitxelena in San Sebastián and Fundaçió Sa Nostra in Palma de Mallorca. Her latest project, the film “Buscando la vida,” will be on commercial movie theatres in Madrid next season.